Kalamazoo River "Sturgeon For Tomorrow" Project News: don't forget - join us at this Saturday's Sturgeon Release event! don't forget - join us at this Saturday's Sturgeon Release event! 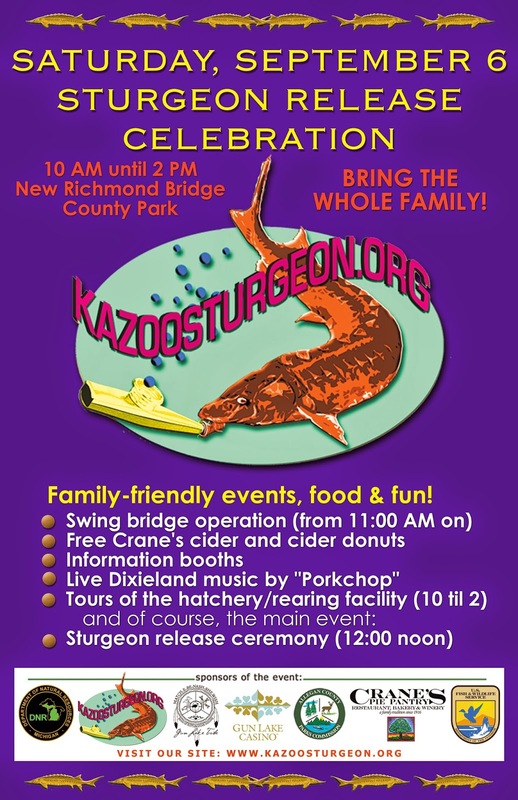 On Saturday, September 6, the local Sturgeon For Tomorrow/Save Michigan’s Sturgeon project (kazoosturgeon.org) based in New Richmond, will celebrate another successful season of rearing sturgeon with a day of events at the New Richmond Bridge Park. The event will take place from 10AM until 2PM at the park. Activities include live music from Dixieland-style band “Porkchop”, operation of the New Richmond swing bridge, tours of the Michigan DNR hatching and rearing facility, various speakers, free snacks and refreshments, a pig roast, information booths and, the main event, the release of the young sturgeon into the Kalamazoo River (at noon). There will be a tribal drum circle at both the opening and closing of the event by John Bush and the Three Fires. The Sturgeon for Tomorrow project is an ongoing effort to help repopulate the lake sturgeon population in west Michigan. Sturgeon live in Lake Michigan, entering the Kalamazoo River mouth yearly, only to spawn and then return to the lake. The sturgeon then take 15 to 20 years to reach breeding maturity. As the number of sturgeon has decreased over the years, this project was founded to assist in restoring a healthy population. More information about the program can be found at the organization’s site at www.kazoosturgeon.org. The release event celebration is free and open to the public. Everyone is invited to come and learn more and participate in this fun family-friendly event.